In this chapter the authors resume the major themes of this book, including the discussion of ethnophilosophy, endogenous research as well as Hountondji’s political activism. The conclusion of this book is preliminary in the sense that any philosophical inquiry, in the spirit of Hountondji, is a never-ending process that cannot lead to ultimate conclusions. Second, philosophy should always remain open to new voices and literatures, such as additional scholarship on Hountondji that the authors were not, due to technical reasons, able to cover. 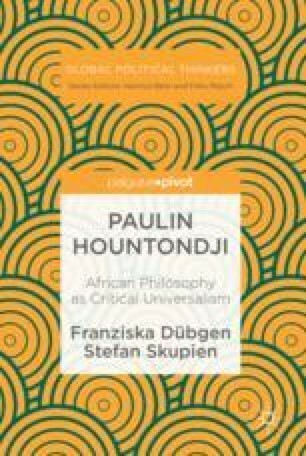 To end with, readers are invited to continue discussing Hountondji’s contribution to contemporary debates on the nature of African philosophy, on global academic injustices, on exclusionary definitions of culture and identity as well as on the scope and methods of transcultural philosophising.